See Action! Osinbajo Orders Immediate Resumption Of 24 Hour Operations At Apapa Wharf! 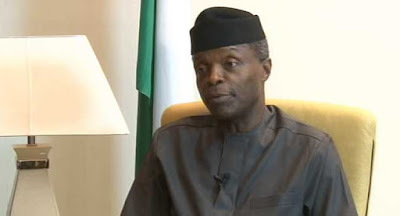 Acting President Yemi Osinbajo, SAN, has directed the resumption of 24-hour operations at the Apapa port and outrightly banned touting by officials or unofficial persons at any port; be it air, land and sea ports in Nigeria. Prof. Osinbajo had on Thursday signed three Executive Orders dealing with the business environment, local content in public procurement and timely budget submission. The Orders take effect immediately. The Acting President also directed that the official approved list of dignitaries that have been pre-approved to be received by protocol officers shall be made available to AVSEC and other relevant agencies ahead of their arrival at the airport. All relevant MDAs at the airports shall within 30 days of the issuance of this Order merge their respective departure and arrival interfaces into a single customer interface, without prejudice to necessary backend procedures,’’ the Acting President directed.